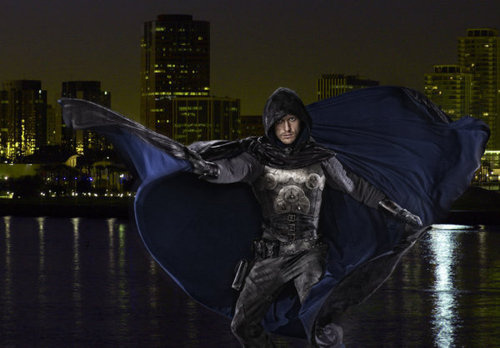 So far, NBC’s The Cape is slowing growing on me. If I was more fickle person and judged it by it’s pilot then it’d be doomed. The rapid storytelling and the blantant rip off of several scenes from Batman Begins and the fact the rapid story telling to get a flimsy two hour plot into a flimsier one hour show kneecaps it even further. So far, this is no Heroes. Granted, it’s not supposed to be. Vigilante’s and Superheroes are two different breeds. The general rundown: Vince Faraday played by David Lyons is a cop in Palm City and witnesses the Police Chief’s assassination first hand by the villain known as Chess played by James Frain. Palm City has several other problems on it’s hands beyond corrupt cops. Arc Industries CEO Peter Fleming also played by James Frain wishes to take the police force private meanwhile a cyberhacker known as Orwell played by Summer Glau is publishing the truth on her website. Vince is offered a job at Arc and after a few investigations he finds out Arc is bringing in the same explosive that killed the chief. Unfortunately, Chess has other plans for him and decides to frame Vince and manages to make everyone thing he’s the real Chess and after a quick run through the train yards by Arc Police it looks like he dies after a fuel tanker he crawled under for cover blows up. Vince survives and is taken in by the Circus of Crime led by Max Malini played by Keith David and after several productive bank heists Vince decides he needs to clear his name and protect the city. And, with Max’s help you have a fairly honest training montage minus the 80’s music. The Circus of Crime has three characters that are memorable and as one reviewer already pointed out: Did NBC create the circus just to reuse sets from Heroes last season? Overall, The Cape is your a-typical vigilante set up minus the whining Bruce Wayne about losing his parents and no mega millions to throw into R&D to build the toys. The only thing Vince has is a cape and the circus tricks. During the first three episodes, Vince manages to find a location for his Bat Cave and begins to build the place up which is one of the better plot lines. The good things: All the actors work with what they’ve got and it turns out okay for most. James Frain and Summer Glau get the short end of the stick for the first few episodes while Lyons and David get the brunt of the good scripting. Lyons isn’t a pretty boy so the vigilante idea works and David’s supposed death scene speech in episode 2 was great. Personally, I’m loving Keith David’s mentor character and it’s great to hear him (without the Disney animation) on a weekly basis. BSG’s Bear Mccreary‘s music missing from Human Target can now be found here and I’m liking the theme music. The problems unfortunately are many: The story does not break any new ground. While Heroes turned into a unmitigated mess during the final seasons, the lightning in a bottle from Heroes Season 1 is nowhere to be found. The editing of the first five minutes manages to have a body count of two people. The whole privatization of the Police Force didn’t work for OCP and the villains like Chess and Scales are okay, nowhere near as interesting as villains from Heroes. Summer Glau, last seen as psychological damaged River Tam and a badly, boring written Terminator can now play a real person and has been saddled with a mysterious backstory (I’m going with Chess’s daughter) and is relegated to playing an Oracle rip-off at first but as of Episode 2 she’s put into the line of fire. In the end, it’s no Heroes but thankfully most of the trappings from the 60’s Batman TV Show have been pushed to the background as of episode 3. If it gets better I’d watch after Chuck instead of on the NBC website. This entry was posted in New Season, Original Series, Television and tagged television reviews, the cape by RK Bentley. Bookmark the permalink.